Spring is most definitely here and the tulips have just finished their bloom and now the poppies are starting. Floral designs on flatware have been a tradition for always. 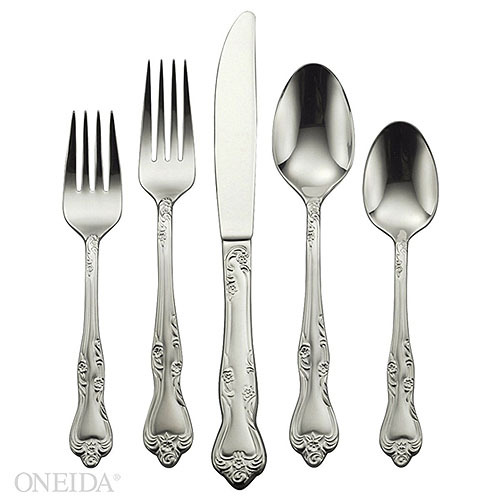 Oneida’s Azalea cutlery set is covered in blossoms, scrolls and leaves. These hefty pieces are in the “fiddleback” design, which is the flared end of the handle looking like the body of a violin or fiddle. This service for eight includes 5 piece place settings consisting of 2 serving spoons, 1 serving fork, 1 sugar spoon, and 1 butter knife. Made with the standard dishwasher safe 18/0 stainless steel.